One Florida school recently stirred up a huge controversy online after they sent home a slip of paper that jeopardizes this patriotic ritual. 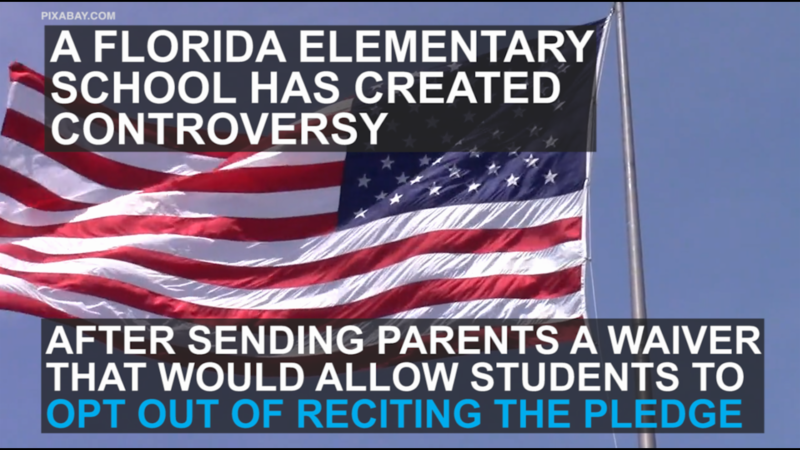 Micah Brienen, whose niece goes to elementary school in Tallahassee, Florida, recently took to Facebook to express his disgust after his niece came home with a "Pledge of Allegiance" opt-out waiver. "My niece brought this home from school today..." Brienen wrote in his post, which has now been shared nearly 25,000. "What is happening to our country?" The form gives parents an option to check a box that reads, "I understand my rights as a parent and I request that my child, noted above, be excused from reciting the Pledge of Allegiance. This request includes standing and placing his/her right hand over his/her heart." Naturally, the form has struck a chord online, and people have started voicing their concerns in the comments. "That's heartbreaking," one woman commented. "We live in a very different country that my grandfather and father served in the miltary (sic) for," said another. "They would hang their heads in shame. As do I." In the wake of a flood of "crazy direct messages" Brienen says he has received, he took to facebook for a second time to clarify his feelings on the matter. "I would just like to clarify, I never once said nor do I believe a child should be forced to pledge to anything, I just personally feel it is respectful to stand for the Pledge of Allegiance in schools, even if you do so in silence. I was shocked when I saw the waiver because it comes across as if schools are now promoting the opt out in some sense. Just because it's a law, doesn't make it right. Laws are passed all the time where people are unaware. My hope is that this post brings attention to people so that maybe the same policy to send out the waivers doesn't pass in another state. Sadly, our American values and traditions are whittling away...What's next? No American flags in schools?? Will future Presidents (Republican or Democrat) be forced to quit saying "God Bless America" at the end of his/her speeches? And for those few ignorants that believe wars are fought for the right to protest the pledge, I'd like to see those people go to a VFW or American Legion meeting and when the pledge is started, stand up and tell them that....good luck with that."